If you have questions about this course or your accreditation, feel free to contact us. Approved by the VA Office of General Counsel and various state bars for 3 hours of self-study credit for VA CLE. Representation before VA, claims procedures, basic eligibility for VA benefits, right to appeal, disability compensation (38 U.S.C. Chapter 11), dependency and indemnity compensation (DIC) (38 U.S.C. Chapter 13), and pension. Also meets requirements for 3 hours of CLE for maintaining accreditation for any given two-year period after the initial CLE accreditation requirement. I am passionate about helping seniors deal with their elder years and with eldercare issues. This passion also spills over to my helping veterans and their survivors plan for their future years. This is because I am a veteran and because I am disabled myself. Most importantly, thanks to the VA healthcare system, I am able to help other veterans become aware of their benefits. My health was going downhill. An undiagnosed condition undoubtedly would have resulted in my early death. The treatments I received from VA health care saved my life from this rare, wasting disorder. Private-sector doctors couldn't diagnose the condition, but VA doctors did figure it out and stopped the disease process. Unfortunately they could do nothing about the residual damage which has left me disabled. Despite the physical limitations, this great gift from VA has allowed me to become actively involved in helping veterans of all ages and also helping seniors in the community plan for their final years of life and obtain needed government benefits. 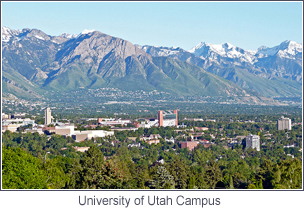 After graduating high school in 1962, I pursued a year of study at the University of Utah. The next 2 1/2 years were spent in the European country of Austria for my church where I learned to speak German and serve the Austrian people. I reenrolled at the University of Utah in studies with the Department of Physics in the spring of 1966. I graduated with a BA in physics and math in the winter of 1969. My sweetheart, Susan and I met and married in the spring of 1967. During my college years, the Vietnam War was in full swing and knowing I would be called up, I decided to enlist in the Air Force ROTC program. I subsequently received a commission as a second lieutenant when I graduated from college. I spent the next year -- from June 1969 through June 1970 -- completing basic pilot training at Webb Air Force Base in Big Spring, Texas. 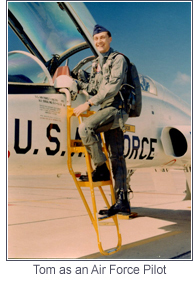 Additional advanced flight training was completed by November of 1970 and I was then assigned as an Instructor Pilot for T-38 advanced jet training at Moody Air Force Base in Valdosta, Georgia. I left the service as a captain with an honorable discharge in the winter of 1973 having completed a little under 4 1/2 years as an Air Force pilot. The years from 1973 through 1985 were spent in a variety of business pursuits. In 1985, I joined a large insurance company as a registered representative and agent. One aspect or another of financial services has been my profession ever since. In 1997, I struck out on my own as an independent registered investment advisor and fee-based financial planner. Because I no longer had group health insurance for my family, I obtained individual insurance for them and I enrolled in the VA healthcare system a few years later. 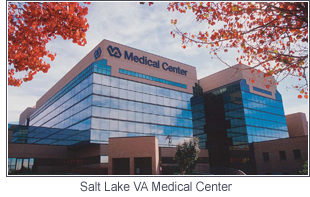 At that time VA was still taking Priority Group 7 veterans into the health care system. As it turned out, enrolling in VA health care was one of the most important events in my life because it prolonged my life and allowed me to pursue the goal of helping helping veterans with their benefits. 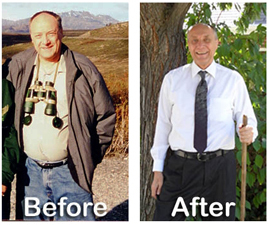 My disability – which is not service connected – and lack of activity had caused me over many years to experience significant weight gain. My primary care physician at VA challenged me to become more involved with my health and helped me enroll in VA MOVE – a weight loss program. The VA MOVE! Program inspired me to do something about my weight and lack of exercise and is continuing to inspire me to fulfill the goals of its program.